I’ve written before about solar power for camping, especially camping from my bicycle. 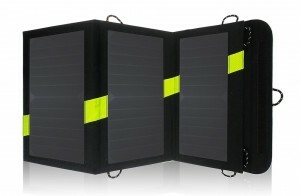 You may have seen my post about my trailer with a solar panel and battery. That is a 12 volt, 22AH system and was intended for powering a small Ham Radio station as I camp. It also would effortlessly charge all those little accessories that we seem to need to live these days: cell phones, computers, iPads, and all those bicycle accessories that seem more and more to charge off a USB port. But, the downfall was it is big and heavy. I also wrote last year about my USB based solar charging system. Why would I mess around with a big solar panel and heavy sealed-lead-acid battery, when the USB system is so compact? While the USB battery pack is 22.5 AH (22500 mAH) and the 12 volt system’s battery is 22 AH, that is apples and oranges, because the voltage is higher. To compare, you need to convert to Watts. 22.5 x 3.7 (the voltage of the cells inside the USB pack) equals 83.5 watt-hours, but 22 x 12.8 is 281.6 watt-hours. Big difference in available power. If you need 12 volts, like for a radio, it takes more power to produce the same current at a higher voltage. And a heavier battery. 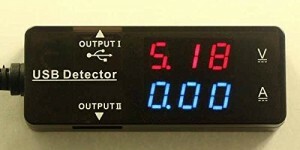 The 12 volt system could be lightened with a lithium-based battery, but they are still expensive and fussy to charge compared to the SLA battery. But the SLA weighs 14 lbs. I’ll say this here, even though I will repeat myself later, you just can’t cheat the laws of physics. You can’t get something for nothing and you don’t get anything for free. More power means bigger, heavier batteries. Faster charging means bigger solar panels with more area. There just is no getting around it and you will see many products for sale, particularly online, that seem to be too good to be true. They are. So, my system hasn’t been changed from last year. I put it together after my trip on the GAP, so I haven’t really tested it under fire yet. I intend to do so this summer. I was digging around the internet and decided to see if there were any better products out there that would improve the setup. I found out that I chose pretty well. 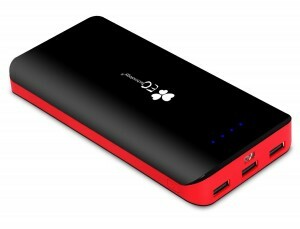 The battery pack I chose, it turns out gets pretty good reviews. The amount of exaggeration of specs on these devices is ridiculous. Fortunately, I must have spotted one with believable claims. I found a YouTube review, so I watched it where he compares this battery bank to another that claimed even better capacity. He dissected them and put them through a bunch of tests. My choice was reaffirmed. If I were buying this again, there are many out there to compete now, more than a year ago, but the majority of them are either junk or too small. They use inferior lithium cells and are cheaply made with overstated capacities. I’d stick to a known manufacturer, even though EC Technology was an unknown to me last year. Anker, who I have bought replacement cell phone batteries and chargers from, has moved into this category and would be a good source now. One thing that I missed is the ability to charge the pack from the solar panel while powering/charging a device from it. The EC Tech pack shuts off the outputs while charging. It’s a very minor thing, but let’s say your phone is very low and you plug it into the solar panel. As you ride (if you have it strapped on you pack in back) and pass into shadows, the phone may shut down. If you can put the battery pack in the middle, you can charge it without fear of dropping out every time you go under a tree. But, it’s not worth buying another now. My philosophy is to use the solar panel to top off the battery bank, then use the battery bank to charge things. With enough capacity to charge a smartphone several times and the odd bike light here and there as well, I can get along without simultaneous charging and use. The solar charge capability is still a fill-in between stops where AC power is found and everything gets a quick fill up. A power strip with built-in USB charging ports is a necessity. I’ve ridden with a group and had one duplex outlet to share among eight people at a campground. Everyone wanted to plug their wall-wart in to charge their devices. Being able to expand the number of outlets while putting some USB jacks in play is helpful. 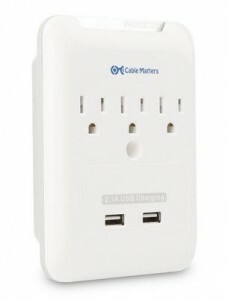 I don’t actually have the one shown, it’s just an example, but have a similar one, as well as a power strip with USB outlets too. You will find these everywhere, Home Depot, WalMart, etc. now. The next video I found was a long, rambling, but incredibly thorough review of some of the Solar batteries – USB battery banks with a solar cell built in. I quickly dismissed them as having too little solar capacity in my consideration. He also includes what he calls some “wild cards” into his tests, which are USB battery banks paired with external solar panels. This is exactly what I had settled on as the ideal way to go. Once again, it was nice to see someone do some tests and reaffirm what my gut told me. So, no change in the system so far this year, but I head out feeling good about my choices. I have used the USB bank alone, both while cycling and as a portable cell phone charger, and am very pleased with it so far. Update: It’s pretty clear from my experience with these and the video above, you can’t shortcut the laws of physics. Bigger solar panels provide more power and charge quicker than small ones. Bigger battery packs hold more power, charge more times and take longer to recharge. It’s all a balancing act. I’ve since picked up another USB battery pack, this one made by Anker and about the same capacity as the one shown. These 20AH range packs will recharge a dead cell phone at least 3 or 4 times, and the assorted bike accessories like LED lights many more times. If you fully deplete the USB pack, it’s going to take a while to recharge. By solar power, it depends on the size of your panel. It might take a couple of days of sun to get a full recharge. Even using AC power, it will take 6-8 hours. For a weekend trip, all you need is the USB pack. It will get you by for a couple days. Then you can recharge it when you get home. 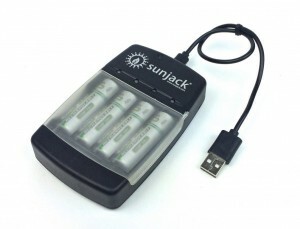 The solar panel comes in for longer trips and the most efficient way to use it is to keep topping off the USB battery pack without waiting for it to be run down completely.